Eagles backup quarterback Nick Foles relied on his faith in God to lead the team to a Super Bowl victory. The following piece was submitted by guest writer Eric Dickens. All ULC Ministers are invited to contribute their own sermons for consideration/publication. 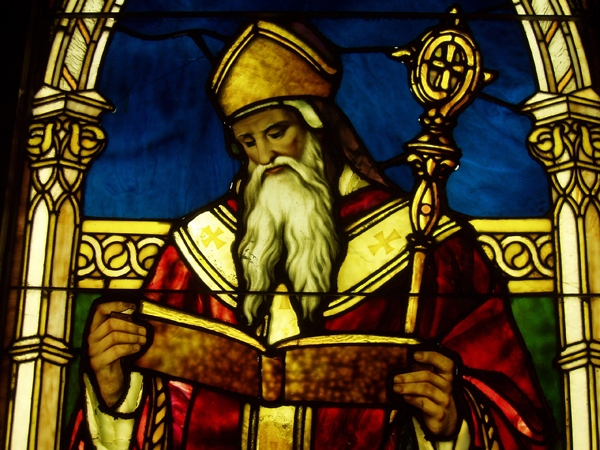 To submit a sermon, please email it to sermons@themonastery.org. If God spent Super Bowl Sunday kicking back with platters of divine snacks and enjoying the fruits of His media marvel creation, He did so without as doubt as to who would win.There was no miraculous helmet catch. No immaculate reception. But regardless, His fingerprints were all over this game. Is there really any other way to explain how a relatively obscure backup quarterback managed to step in for his injured teammate, rally a crew of unabashedly God-loving underdogs and lead the Philadelphia Eagles to take down the mighty (and allegedly godless) Tom Brady/Bill Belichik dynasty in a stunning 41-33 victory in this year’s Super Bowl? It’s unquestionable which team was more devout, more deserving of God’s grace. It was the Eagles, by a long shot. Without a championship since 1960, the Eagles were forced to turn to a backup quarterback after superstar Carson Wentz – himself a devout Christian – suffered a devastating knee injury in December. With big shoes to fill in very little time, replacement QB Nick Foles was encouraged to toss up “faith throws” – real Hail-Mary-type downfield chucks that require a certain rapport with receivers – and perhaps a little help from the man upstairs. He connected on many such throws en route to victory. 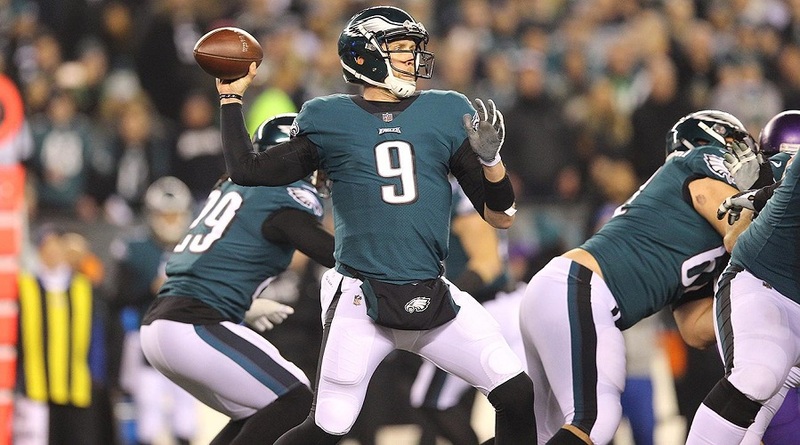 “When you consider how little time he had to prepare, how little football he’d played in the past two years, and how he’d completely fallen out of the NFL’s collective consciousness until six weeks ago, Foles’ emergence in the playoffs as an efficient quarterback is a small, modern football miracle,” wrote Kevin Clark of The Ringer. Offering advice and encouragement to Foles was quarterback coach Frank Reich, who himself served as a seminary president before finding his way back into the football ranks. Still don’t believe God was on their side? Just wait, there’s more. 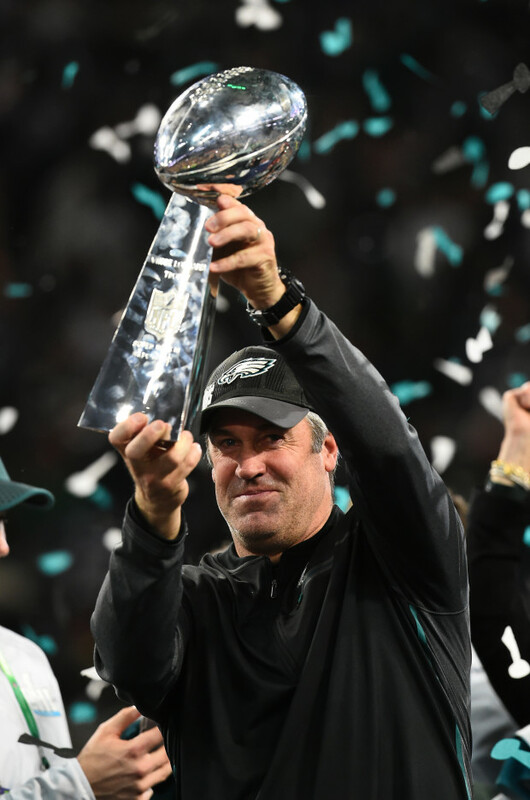 To beat the mighty Patriots, the Eagles relied heavily on the instincts and courage of head coach Doug Pederson, a man of deep Christian faith who rose through the ranks and was a surprise hire by the team back in 2016. On more than one occasion, he made risky play calls that 99% of NFL coaches wouldn’t dream of trying. They all worked out in his favor. Eagles head coach Doug Peterson lifts the championship trophy. In an emotional post-game interview, Pederson knew who should get the credit. “I can only give the praise to my Lord and savior Jesus Christ for giving me this opportunity,” he told reporters. When it was all said and done, many of these same players huddled in a quiet room, away from the cameras and confetti, immersed in prayer. It seems THEY knew who had given them an edge. Forever cemented as a Philadelphia sports hero after the win, it’s incredibly to think that Nick Foles had contemplated walking away from football after his career appeared to stall. But after some contemplation, he decided that wasn’t God’s plan for him. Clearly, the Almighty was smiling down upon the Eagles last Sunday. Going into the game, few could have predicted the underdogs would come out on top. But clearly, the doubters underestimated the power of faith in the equation. It just goes to show: when you give glory to God, anything is possible. If god has time to help a team win a game then surly he has time to fix the problem plaguing this world. Notice he/she has not chosen to intervene at any level. With all the problems in the world, I would hope God focus is on things besides football. lmighty God, I think He is capable of ‘multi-tasking.! Given the state of the world, clearly he’s an underachiever! Nothing happens without His permission. That’s why He is God. I stopped watching football when they stopped standing for the national anthem. That said I don’t think god had anything to do with the outcome. Any team can beat any other team on any given day. Most of the time its the team with the best players but every once in a while the underdog is just a little more hungry and the best players a little to cocky. LOL! This is a nice little bit of satire, Eric. ‘Looks like some here aren’t getting that, but that’s what makes it masterfully written. Good read! Isnt karma a roundabout way of describing the holy spirit?……..if you buy this stuff.. .. . I am not christain however was raised that way. Nowhere and nowhen ever have i heard the holy spirit to be step thru to god. Christians believe (however weirdly) that Jehovah, Christ and the Holy Spirit are one in the same. Loosely, not unlike viewing Jehovah as mind, Christ as heart, and Holy Spirit as the hands that do the work. In that way, achieving balance is perhaps one methodology used. The new testament teaches that Jesus is the intermediator between us and god……. … I buy very little of it. I have mentioned before that in this age of modern science; belief in a sky god or any other actual physical being is rather outdated. I may be showing my age but Eric von Danicon (sp) likely got it right. God, was an astronaut. See the original series of Star Trek, episode titled, Who mourns for Adonis. Nice article and thank you for writing this.